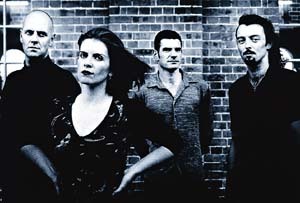 CELTIC rock band KILLKENNY made its debut on Boxing Day 1999, after guitarist MICHAEL STOVE and singer and multi-instrumentalist SUE CARSON spoke about the project for years. Playing at the Great Northern Hotel on New Year's Eve, Stove said it had taken the pair almost 18 months to find the right musicians to complete the line-up. They finally found bass player PETER SCHILLERT and drummer JASON GALE (ex-JACKAL), to fill the role. Gale's rock experience, along with Stove and Carson's rock backgrounds, contribute to the harder more contemporary edge of Killkenny's sound. 'I think we're a lot harder, more rock'n'roll influenced than other Celtic bands,' Stove said. Now boasting '40 or 50 songs' Killkenny plays covers by Scottish Celtic rock band WOLFSTONE and London Celtic rock group THE LEVELLERS, as well as six originals. The group also puts a Celtic spin on contemporary rock tracks, such as MISS YOU LOVE by SILVERCHAIR.